The LBA Woods are Not Lost! Feelings ran high in the crowded City Council chambers on November 18, in response to the release of the much-anticipated Community Park Suitability Study. The study had been requested by the city months before to evaluate five properties scattered throughout the city as a future park. Two of the parcels, privately-owned and known as "Bentridge" and "Trillium" by their developers, form a contiguous 150 acres of woodland known unofficially as "The LBA Woods" by the community. As parkland, these two parcels could offer amenities such as wildlife habitat, natural areas, hiking trails as well as soccer fields and a dog park. Supporters of saving the LBA Woods were cautiously elated when City Council members expanded the study to include "open space and habitat" as valued criteria. During the study period, the community-based advocacy group, the LBA Woods Park Coalition, continued its efforts to inform the public about the merits of the LBA Woods for a park. More than 5,200 signatures supporting the LBA Woods Park concept were collected to present to City Council, "SAVE LBA WOODS" yard signs appeared in every part of the city, a garage sale raised a surprising amount of funds for the campaign and was duly celebrated with an ice-cream social. The suitability study as presented on November 18 was deflating for many and more than disappointing for supporters of the LBA Woods. There were many questions by the public and City Council members about the goals of the study and the explicit differences between an Open Space and a Community Park. To clarify: Watershed Park, Priest Point Park, and Grass Lake Park are Open Space Parks (featuring natural areas, wildlife habitat, and walking paths); Yauger Park and LBA Park proper are Community Parks (playing fields, skate park, basketball courts, and other recreational facilities). 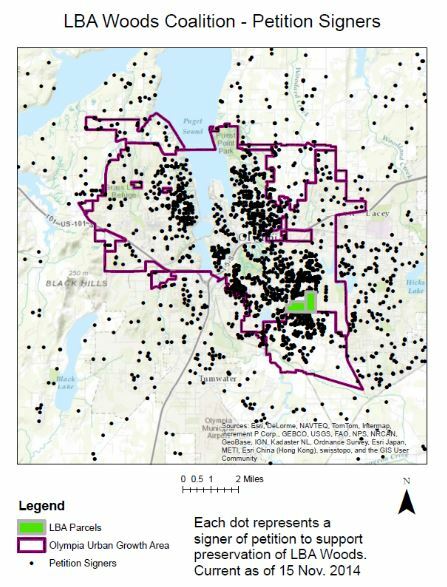 The evaluation of the five parcels was based solely on their suitability to accommodate a dog park and four contiguous soccer fields - an apparent need in Olympia, which has no dedicated rectangular fields. Habitat and open space values were not given equal consideration in the study. The LBA Woods were ranked poorly as locations for soccer fields - of course. The dense cover of coniferous and deciduous trees, the rich understory of native plants, and the natural rolling contours of the land make most of these properties unsuitable for level playing fields. This low ranking might be a blessing in disguise: nearly half of each wooded parcel in LBA Woods would have to be "grubbed and graded" (cleared and bulldozed) to accommodate the soccer fields, parking, and dog park. 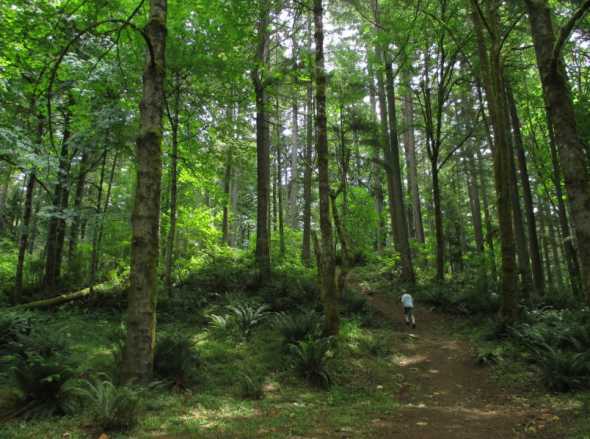 The coalition is committed to continue working with City Council and the Parks Department, and to helping organize the positive efforts of Olympia-area citizens and groups interested in this critical conservation issue. There is much to be done. The City Council and the Parks department need to hear from citizens about the critical need for Open Space parks and for the conservation of LBA Woods. This is urgent. And to make this a reality, the LBA Woods Park Coalition is planning a pledge campaign and seeking grants and donations to help purchase the land and protect it from imminent development. We are working with other conservation groups. We can all move forward together as individuals and as a city to save this "little jewel," this "precious patch of paradise." We all need LBA Woods. The LBA Woods Park Coalition was heartened and energized by the number of citizens who spoke out - despite the results of the suitability study - to urge the City Council to find some way to save the woods as an Open Space park. Dozens of citizens stepped forward during the Council's public comment period to support LBA Woods as the next city park: for the wonderful trail system already in place, for the life-supporting canopy of trees and native plants, for the fifty-eight species of birds observed there, and for the humans who seek solace and quiet time in nature. Here are some of their comments, transcribed from TCTV's taping posted on the City Council's website. "Everybody needs the LBA Woods. We need it for our sanity, for our environment...it is a beautiful place to de-stress, to become human again." "LBA Woods... we consider a precious patch of paradise... It is a wonderful place to walk... It gives you such an uplifting feeling. It just improves your life." "Cities over the long haul, in large measure, define themselves and secure their future by the care they take of their amenities, their assets, their public amenities, and not least their natural value." "What you have here is something really valuable. You've got a group of people...who have shown their commitment to keep this place clean and managed and the trails maintained at no expense to the city...Think about LBA Woods not as "Do we want to buy this land?" but as "Do we want to enable this community of stewardship?" "I love my home and my community...We want it Olympia to continue to be absolutely exemplary in every way, and just a model for all communities. Towards that end I believe there are several things that we can do and one them is to preserve our green spaces. LBA Woods is a little jewel among other jewels." "Nature is something that endures as a value and is something that Olympia values very dearly." "This possibility of it being conserved is a great hope of mine for my family and all families to come." The feasibility study notwithstanding, the City Council and Parks have indicated that these statements of hope, love and purpose are making a difference in their planning. The feasibility study has provided useful information, but its recommendations are just one piece of the planning puzzle for parks.